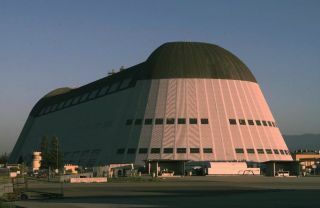 The historic Hangar One at California's Moffett Field, photographed in 1999. A Google subsidiary will lease a NASA facility in California's Bay Area for $1.16 billion over the next 60 years, agency officials announced Monday (Nov. 10). Planetary Ventures, LLC will lease Moffett Federal Airfield (MFA), which is currently managed by NASA's Ames Research Center, and restore the facility's historic Hangar One, a huge building that has been a Silicon Valley landmark since the 1930s. "As NASA expands its presence in space, we are making strides to reduce our footprint here on Earth," NASA Administrator Charles Bolden said in a statement. "We want to invest taxpayer resources in scientific discovery, technology development and space exploration — not in maintaining infrastructure we no longer need. Moffett Field plays an important role in the Bay Area and is poised to continue to do so through this lease arrangement." The agreement should save NASA $6.3 million per year in operations costs on top of the lease value, agency officials said. Planetary Ventures will invest more than $200 million in the 1,000-acre (405 hectares) property, which also includes Hangar Two and Hangar Three, two runways, a flight-operations building, and a private golf course. The company will refurbish all three hangars and use them as research facilities in an attempt to develop new technologies in space exploration, robotics and other high-tech fields, NASA officials said. Planetary Ventures will also establish a facility on the site that will teach the public about MFA's historical significance. "We look forward to rolling up our sleeves to restore the remarkable landmark Hangar One, which for years has been considered one of the most endangered historic sites in the United States," said David Radcliffe, Vice President of Real Estate and Workplace Services at Google. Ames is NASA's lead center for supercomputing and has helmed a number of important missions over the years, including the planet-hunting Kepler space telescope and the Lunar Atmosphere and Dust Environment Explorer (LADEE) probe, which studied the moon's wispy atmosphere after launching in September 2013.